In the previous news I talked about the mild weather and one of my own personal successes with a fantastic 46lb common. Well despite three of four days of heavy frosts last week the general tendency for mild weather has persisted and even if it has been fairly wet the fishing, compared to previous Januarys has been very good. As per the previous post the month kicked off with two Dutch lads who managed 10 runs in four nights fishing with 8 carp banked and a gem of 45lb the best fish of their haul. Starting on the 2nd of the month, Jimmy Heijink and his mate set up on pegs 5 on the Croix Blanche and 13 on the Tortue. The used a bait boat to drop PVA bags of pellets and strawberry boilies to the shallower areas where fish were showing. The water levels were quite high so that would be around 12 feet deep. Within 24 hours they had managed several fish to upper 20’s, which is pretty good for a month of January. Despite being mild the weather was quite extreme with gales force winds and heavy rain showers. The lads stuck it out however, with Jimmy moving up to peg 15, due to the activity he had observed in front of that peg. The last night saw one more fish out of the Croix lake and the icing on the cake for this early season session a superb 20.5kg (45lb) mirror. The lads did very well and it goes to show that good results can be had year round in the right conditions. While we saw poor results in the autumn, I sure this was down to the unusual weather. January temperatures were more like November and the carp seemed top respond in the manner of an autumn session. I then followed on with a couple of nights on peg 14. I was alone on the complex and the rain was pretty heavy, but the 3 carp banked made up for the less than enjoyable conditions. The fish went, 22lb, 23lb & 46lb. I managed to get out again the following week for an overnighter and once again got amongst the fish. Since my last trip a week ago, in unusually mild conditions we’ve had something of a cold snap the last few days with several heavy frosts, and cat ice in the edge of the lakes. I’d guess the night time temperatures got down to -6°C. So Wednesday morning, with the frost still on the ground and ice still in the edge, I set up on the Peg 14, where I’d managed the fish last week. I reasoned that if they were active they may still come on the plateau in the Tortue to feed. Again tactics were the same, a PVA bag of pellets and chopped boilies & some 14mm Quest Pineapple, with a Pineapple/Crab snowman combination. As we settled in, things didn’t look anything like as promising as the previous visit. There I’d seen activity right away, but here with a cold wind and spitting rain, nothing was visible. With my mate Laurent we settled back in the shelter of my tarp to enjoy a couple of beers and some dinner. As the night and the cold came in we decided to call it a night and Lolo went off to his bivvy, while I climbed into my comfy hammock and was soon out like a light., wrapped in a toasty down sleeping bag. I was awoken around 2:30 am by a couple of beeps in my central rod. Before I could get out of my bag and put my boots on the fish was motoring. Once I made contact it plodded a bit but came fairly easily to the net. It turned out to be a nice clean looking mirror of 29lb. I was well chuffed, as I really thought with the frosts I’d missed out on the feeding fish. After recasting as I lay back in my bed listening to the rain patter on the tarp a large carp turned over in the margins with a big splash. Less than an hour after the first fish, I was off again. This one really did motor. It had taken probably 30 or more yards of line before I leaned into it and continued to pull hard once I had made contact. It gave a spirited fight before going into the net. A smaller fish this one at 25lb 8oz. Anyway another bag was lobed back out into the blackness and I was off to the land of nod, waking at after 9am when Laurent popped his head into my swim and looked chuffed when I suggested coffee. A couple of cups each later and we were talking of packing up… Two Dutch chaps came round for a chat, and my centre rod dropped back before tightening up again. I struck but with 3.5lb rods only felt a slight resistance. I suspected one of the large bream was the suspect…. But no it one mighty big Crucian carp of 7lb 8oz. The biggest one I have ever caught. I was well pleased to get a couple more nice carp. Another pair of Dutch anglers had joined us for a four night session to go for the carp and the pike in the lakes. Benefiting from my tips and applying pretty much the same tactics they set up on pegs 15 & 4, with one guys moving over the peg 14 when I vacated it. The first night saw them bank a nice 26lb common and a few pike to 90cm, which was just into double figures. They were less fortunate than I with the rain as the next two days was pretty solid. 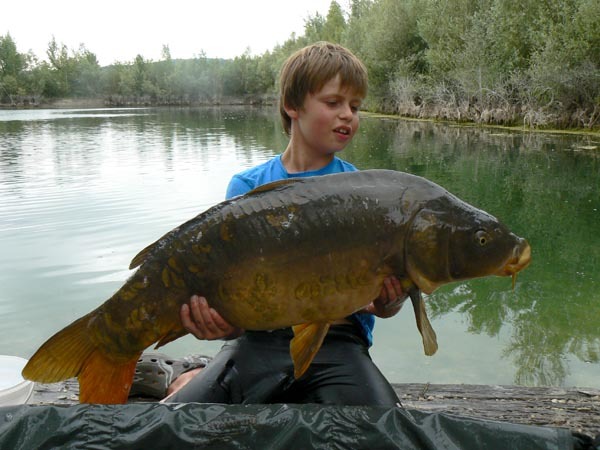 But by persevering the managed four more carp with the icing on the cake for Harry Van Leeuwen at just under 40lb. The last three January’s have seen the lakes frozen for three to four weeks at least. Naturally the lakes were closed and no anglers present and I was unable to fish the winters here. This year then is a real bonus, I can’t wait to get back out. Just returned from a couple of nights on the Tortue Lake. Don't get much time to fish these days, but the mild weather was just too tempting. PVA bags filled with carp pellet and Quest Pineapple boiles were cast to the plateau area from peg 14. I manage four runs for 3 fish. Two were 20's, but the third was a real prize. A new pb common of 46lb. 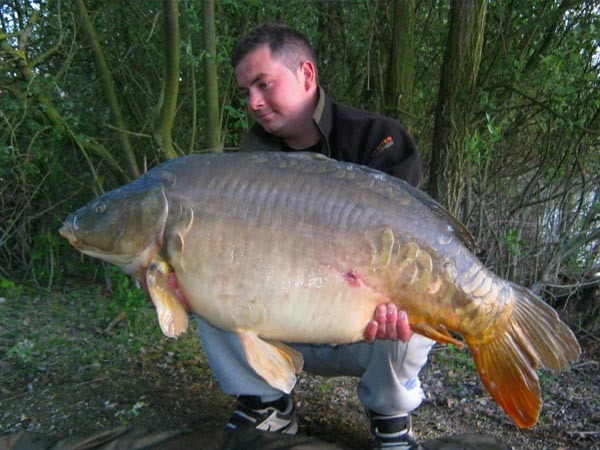 This was a fish I photographed on 2 occasions at 42lb last year for others and definitely one I was keen to catch. Well now its done and four pounds up in weight. Needless to say I'm chuffed to bits. Following what was the hottest and driest Spring since records were kept, we moved into a month of July which proved to be the wettest and coldest in thirty years. The climate really does seem to be in complete turmoil. This in consequence has a knock on effect for the fishing. With so much rain during July the lakes fished poorly in comparison to the previous ones. I believe that the influx of cold water, mostly through the water table, and therefore cold, caused the carp to moved up off the bottom and find a comfort zone in mid water. Groups of fish could regularly be sen in mid water. This made them very hard to tempt. Zigs were used with some success, but generally speaking things were not very productive. I have over the years seen this on a number of waters, where July just in not a very good month for fishing. Anyway we moved into August and things improved, with a mixture of cool cloudy weather with a few storms to hot sunny days. The fishing did pick up though and there were a few notable weeks where good numbers and size of fish were landed. Paul Hamer and George Thomson, regulars at the venue, settled into peg 3 & 4 for the first week of July and with the cooler weather had a good week. Highlights for the guys were mirrors of 37lb 2oz, 34lb 10 oz and a Catfish of 33lb 12oz. With the big cats now going over 100lb in the Tortue, Welsh lads Mark and Chris set out their stall using halibut pellets to tempt a large ‘Silurus’. They were not to be disappointed, banking a number of fish over 60lb, including two 70lb fish and a 85lb specimen, before banking one even bigger that bottomed their scales. Estimated at over 100lb it measured 2.10m. Belgian angler Danny de Clerk also had a good session on the same peg as the Welsh lads, banking over 35 fish during his week to over 39lb. He had several carp on zigs, even taking a thirty pounder in the dead of night on a piece of black foam. As we moved into August the lakes seemed to pick up nicely. Probably the best catch on the Croix Blanche Lake was to my mate Laurent Amargé, who proved that correct use of a bait boat can catch you a lot of fish. As this was a family holiday from him his, wife and two sons, he didn’t fish nights but still ended his week with 25 carp to 38lb, and a dozen or so catfish to 26kg. Had he fished night too I am sure he would have had over 100 runs. At one point when I was with him he just could not get all his rods out without a run occurring. 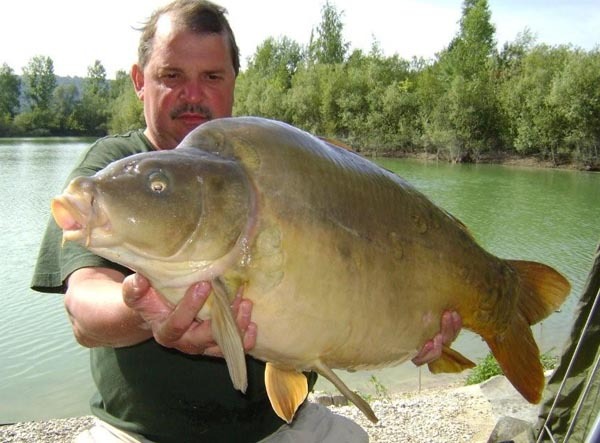 An excellent week and proof that the Croix Blanche can be a very productive lake. As we moved to the end of the month there were weeks when it just seemed to click. When this happens everyone seems to connect with a good number of big fish. Such was the case with the north of England lads Terry and Colin from Liverpool and Yorkshire boys Keith and Steve. 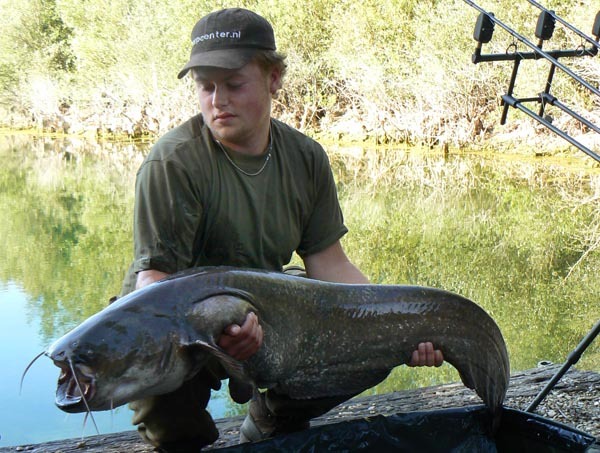 Colin fishing peg 11 banked 15 fish with carp to 42lb, and catfish to 46lb. While Keith fishing opposite him had 13 fish including mirrors to 40lb 1oz, commons to 45lb 10oz and catfish to 66lb. During the same period on the Croix Blanche the Dutch/English duo of Rutten and Barton managed a very creditable tally of 12 fish in 3 days the best being a 37lb Mirror. Anyway as we move into mid September, I’d expect the results to improve as the fish feel the onset of winter and the need to pile on the weight for the colder months that are just around the corner. Two young Dutch carpers braved the icy nights and frosty mornings to get off to a cracking start at the Croix Blanche Lakes complex. Early March is often an uncertain time fishing wise as we are only just breaking into Spring. But Joey Boots & Nick Lemmen made the most of a quiet period at the venue to tempt some nice fish. The duo set up on peg 6 in front of the mobile home, which they had decided to rent out to improve the comfort factor for the week, and managed a couple of smaller fish 14lb & 18lb in the early part of the week, despite night time temperatures that went down to -3 and heavy frosts that left the whole lake blanketed in white at dawn. The weather picked up mid week after a short bout of rain and the temperatures remained positive round the clock. Fish began to show so they immediately placed lines on these areas. Their change of tactics was rewarded initially by a nice mirror just under 30lb at 29lb 7oz. After a spot of piking, where he saw a number of large fish active, joey returned to his mates peg to collect his carp tackle and move to the Tortue lake and set up in peg 13. This proved to be a wise move as the first afternoon he banked a superb 35lb 2oz Mirror. The next day set up in the same swim abd landed the prettily scaled mirror in the first picture which smashed his PB with at a hefty 46lb 2oz. The successful tactics for Nick were Proline Fishy Curry snowman rigged boilies over halibut pellet feed. Joey on the other hand used Herman Comen Tutti fruitti pop ups also fished snowman style over a mix of crushed pellet, broken boilies, maize and maggots. These guys certainly had their risk of an early season session pay off. After a spot of piking, where he saw a number of large fish active, Nick returned to his mates peg to collect his carp tackle and move to the Tortue lake and set up in peg 13. This proved to be a wise move as the first afternoon he banked a superb 35lb 2oz Mirror. Well the rain has given way to very much colder temperatures across northern France and we have even had our first frosts. All of this has naturally had a knock on effect for the fishing at the venue, resulting in the catfish activity slowing right down and the carp being a lot harder to tempt. It seems like the seasons are at least a month ahead of last year. September did see the fish on a bit of a feeding spree though with Andy Lear’s party really getting amongst the fish. On peg 13 Andy had carp to 33lb and catfish to 38lb. On the Croix Lake peg 2 Mark Santo really did haul, landing 28 carp to upper 20’s, while Steve Robinson & Dave Jackson topped their catches with a brace of large catfish of 59lb & 36lb 12oz. See Andy’s video in the last blog post. The Vermeer party from Holland also had some great fish from the Croix Blanche lake, which has seen a real boost in numbers of fish banked since the stocking of 45 twenties to 26lb in June. Their top fish was a superb mirror of 46lb 2oz and is the best this year landed from the water. As we moved into October Steve Breitsprecher and Gary Hutchinson managed to turn a difficult week around with a very good average size fish. Steve topped his catch with a lovely 42lb common, but also banked commons of 36lb & 27lb as well as mirrors of 32lb, 31lb, from peg 11 on the Tortue lake. It looks as though we are in for an early and cold Winter, following a very wet second half to the summer. The years follow each other but are so different. Belgain carper Rudy Coussens enjoyed a successful visit to the Croix Blanche lakes on the first week of September. Fishing on the Tortue lake on the now famous peg 13, he banked fifteen carp and a giant catfish. His average was very good with most of his carp going over the 30lb mark with a top fish weighing in at 35lb. Eleven of his carp were over the thirty pound mark. To top of his haul of fish he also banked a large catfish that tipped the scales at 54.8lb. His successful tactic was to use his homemade Mexican Onion flavoured boiles fished with a bait boat to ensure spot on presentation in 3.5 metres of water. These baits were introduced on his arrival and left for 24 hours. The fish soon began to roll on the spot. Rudy said ".....the first day ( saturday ) I threw my boilies and waited till sunday to fish on it. The first day the carp started to roll like crazy, but I waited...." In all 13 fish fell to this tactic. Check out the photos on the website!! 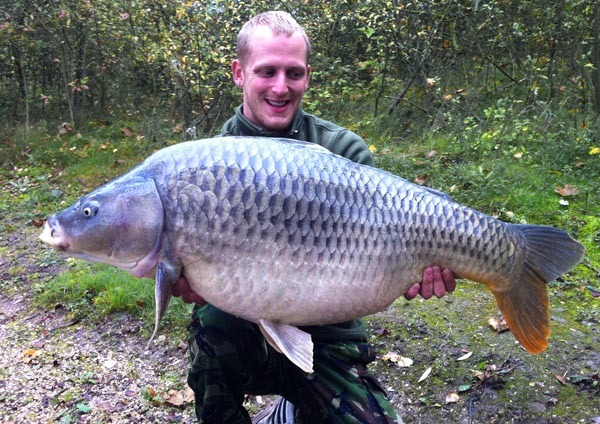 UPDATE: Rudy's friend Danny de Clerck also got amongst some nice carp during the week. I have now been sent some pictures with fish of 35lb 2oz ; 35lb 6oz ; 36lb 10oz ; 37lb 8oz & 39lb 2oz. He also had a catfish of over 40lb. See the website for photos. Young Dutch anglers Bob & Kaz Van Leeuwen proved this week that you don’t need to have years of experience to get amongst the fish. They lads aged sixteen & eleven banked 27 carp to over 34lb during their weeklong stay on peg 6. The family had booked the mobile home so that the parents could share their week in comfort while the boys set up on the peg number 6. Fishing with their home made boilies they immediately got amongst the carp taking four fish the first night. They continued in the same vein taking a mixture of carp and catfish too to over 40lb. The palm though for the week went to the young brother Kaz aged just eleven with a lovely mirror of over 34lb and a catfish of 41lb 8oz. Another fish of note was a fabulous 20lb plus linear also the the rods of young Kaz. Belgian carpers Rudi Bru and Pete Bleyaert got in amongst some superb carp and cats in a short three nighter in the company of their wives this week on the Tortue Lake. As they arrived on the lakes they opted for peg 15 at the top end of the Tortue as there must have been 100 carp sunning themselves on the surface. The first 24 hours in the warm weather proved unproductive with just one small cat to show for their efforts. A change in the weather with a thunder storm and some rain soon put the fish back in the feeding mood and in the next few hours they banked several cracking fish. Pete managed a lovely mirror of 45lb 2oz (20.5kg) as well as a 38lb 5oz (17.6kg) Common. Rudi not to be out done also landed some nice carp with a Mirror of 36lb 5oz and Commons of 24lb 5oz and 22lb 4oz. The successful bait was the Proline Red Devils and a homemade garlic flavoured boilie. The flurry of action ended with the return of the hot sunny weather, and reluctantly they headed back to Belgium. 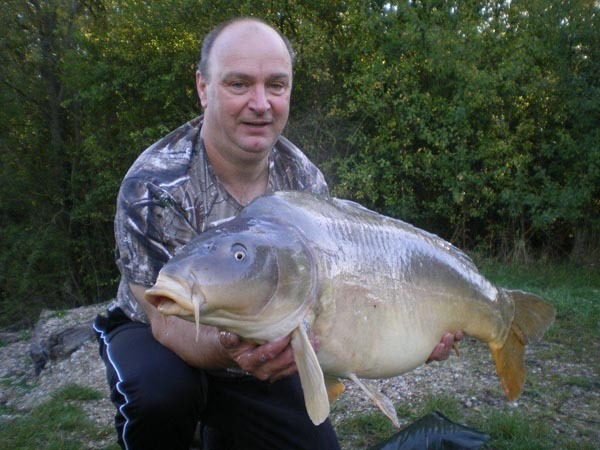 Two fish over 20kg (44lb) were landed this week in a carp bonanza that left everyone happy. With the cats in a very voracious mood of late the carp had been hard to tempt, but not this week. The weather was roasting hot but it didn’t put the carp off going on the munch. Andy Phillips opened the account with a cracking 47lb 8oz mirror from peg 14, while peg 10 followed suit 24 hours later with a 44lb mirror. The catch of the week though went to Adam Lowridge on peg 11 who banked 18 carp including 8 thirties as well as cats to 37lb. In all 15 fish over 30lb were banked with catfish to 45lb. Successful tactics were hempseed and boilies for the carp with Maineline Cell and SBS baits doing the business, where as pellets and boilies sorted out the catfish. Most carp came at dusk to midnight or early morning, as the days proved hot and still only producing the odd welcome daytime catch. Surprisingly most of the cats were caught during the day. A good number of fish banked this week but it was the average size that was pleasing to see. 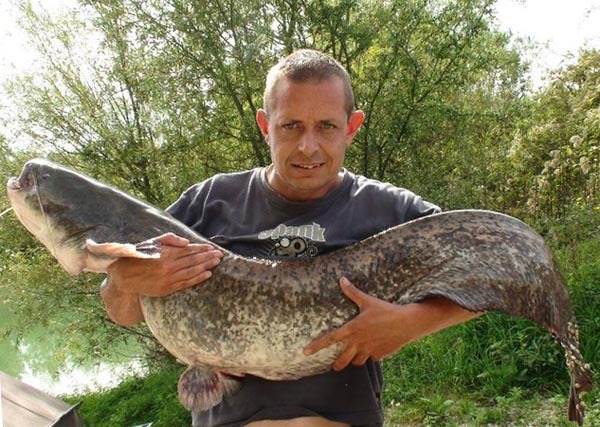 The catfish were extremely active, and as comments seen on forums about other site they were giving good sport with some real monsters landed. The best carp of the week was a superb 48lb common, a magnificent fish. Other large specimens included commons of 46lb 2oz; 38lb; 30lb 8oz. As for the mirrors the largest went 46lb followed by 3 fish of 39lb+; 30lb; 25lb; 22lb; 22lb. 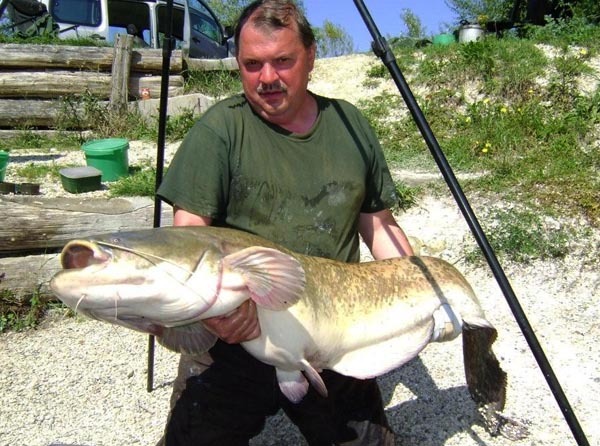 The largest of the catfish went 81lb with others of 77lb; 77lb; 57lb 2oz. Successful technique was pellets, hemp and the Croix Blanche Special boilies fished snowman style.